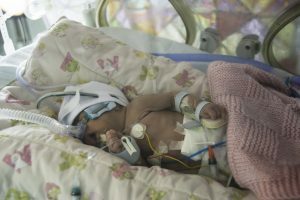 In the UK, the neonatal intensive care unit (NICU) cares for approximately 95,000 critically ill newborn babies per year, including many who are born prematurely. The care provided is among the most intensive, specialised and high dependency within the hospital. Uniquely, delivery of intensive care is combined with attending to each baby’s individual developmental needs at this critical time, as well as supporting the parent-child bonding. Babies in the NICU typically have multiple clinical attachments to deliver the support they require, as well as a variety of sensors for vital sign monitoring (as shown in the photo). These sensors all currently require connection by separate wires to a monitoring unit outside the incubator. The inventors are developing a wireless bridge between the vital sign sensors and the patient monitor, to reduce the barrier to parent-baby bonding that the current, wired system presents. This development will help to increase the uptake of Kangaroo Care (skin-skin contact between a parent and their baby), which has been widely demonstrated to improve clinical outcomes in pre-term neonates. The goal for this i-Teams project is to investigate how best the system can be deployed to maximise the potential for a positive clinical impact. This could be achieved by investigating different routes to market, or identifying parallel application areas which might benefit from such a system.